Toronto, Canada, 2015-8-7 — /Travel PR News/ — Four Seasons is honoured to have been recognized over the years by some of the most reputable industry groups and respected publications in the world for excellence in luxury hospitality. Whether recognized by industry leaders or guests, these awards and accolades reflect the commitment of Four Seasons to setting the standard for service excellence and the dedication of its employees to providing the ultimate guest experience. Four Seasons is focused on harnessing the company’s culture – commitment to its people, a passion for service, and evolution through continuous guest-focused innovation – to ensure Four Seasons continues to redefine and set the standard for luxury travel around the world. 22 Four Seasons properties were awarded the AAA Five Diamond ranking in 2015. This year’s awards recognize more than 50 percent of Four Seasons hotels and resorts in North America including Four Seasons Resort Orlando at Walt Disney World Resort and Four Seasons Hotel Denver for the very first time. In addition, three Four Seasons properties have maintained their Five Diamond rating for 25 or more consecutive years including Four Seasons Hotel Chicago, Four Seasons Hotel Boston and Four SeasonsHotel Washington, DC. 20 Four Seasons properties were recognized with Five-Star distinctions. 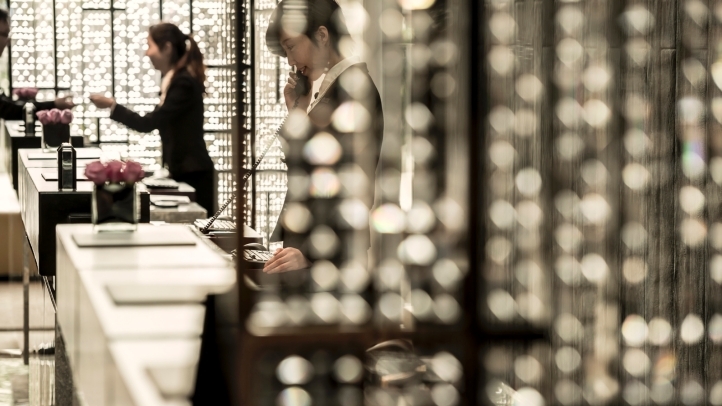 For a second year, Four Seasons Hotel Hong Kong received quadruple Five-Star honours: a Five-Star Hotel; two Five-Star Restaurants, Lung King Heen and Caprice; and a Five-Star Spa. For the first time ever, the 2015 Gold List was hand selected by Condé Nast Traveler editors, writers, and network of influencers. 4 Four Seasons properties were named to Condé Nast Traveler’s 2015 Gold List. Seven restaurants at six Four Seasons hotels currently sparkle under a canopy of 12 Michelin Stars, including the world’s first Chinese restaurant to achieve the highest ranking of three Stars. Lung King Heen (3 Stars) and Caprice (2 Stars) at Four Seasons Hotel Hong Kong; Le Cinq (2 Stars) atFour Seasons Hotel George V, Paris; Zit Yat Heen (2 Stars) at Four Seasons Hotel Macao, Cotai Strip; Il Palagio (1 Star) at Four Seasons Hotel Firenze; Il Lago (1 Star) at Four Seasons Hotel des Bergues Geneva; and Le Cap (1 Star) at Grand-Hôtel du Cap-Ferrat, A Four Seasons Hotel. 44 Four Seasons properties were recognized on the T+L 500. 24 properties received 39 World’s Best Awards, the most of any luxury hotel brand, and Four Seasonsreceived honours as one of the Top Hotel Brands worldwide. Honours include: #1 Top City Hotel and the #1 Top Resort in Australia, New Zealand & the South Pacific withFour Seasons Hotel Sydney and Four Seasons Resort Bora Bora, respectively; and #1 Top Small City in Europe, Four Seasons Hotel Istanbul at Sultanahmet for its second year in a row. Four Seasons received 2 of the top 10 spa awards in the World’s Best Hotel Spa category, for Four SeasonsHotel George V, Paris and Four Seasons Resort Bora Bora. 43 Four Seasons hotels and resorts were honoured with 118 TripAdvisor Travelers’ Choice Awards, including ten properties receiving four or more awards, most notably the #4 placement for Four Seasons Hotel Gresham Palace Budapest in the Top 25 Hotels in the World category. 44 awards were given to 38 Four Seasons properties in the Luxury Hotels category and 20 propertiesreceived 22 awards in the Best Service category. Four Seasons was recognised as the Best Hotel Chain in the EMEA region and Best Hotel Chain Dining/Restaurant in the Frequent Business Traveler GlobeRunner Awards. For the 17th consecutive year, Four Seasons was named one of FORTUNE Magazine’s 100 Best Companies to Work For. Of the more than 29,000 properties AAA reviews every year, Four Seasons hotels and resorts are among the 0.4 percent that made the AAA Five Diamond list. 22 Four Seasons hotels and resorts received the AAA Five Diamond Award. 18 Four Seasons hotels and resorts received the Forbes Travel Guide Five-Star Hotel Award out of list of 97; Four Seasons received the most Forbes Travel Guide Five-Star hotel awards. An exclusive list of 28 restaurants included three Four Seasons hotels as recipients of the Forbes Travel Guide Five-Star Restaurant award. Of 35 spas recognized, four Four Seasons Spas received the Forbes Travel Guide Five-Star Spa award. Condé Nast Traveler’s Readers’ Choice Awards recognizes the world’s most discriminating travellers’ favourite cities, islands, hotels, resorts, and cruise lines globally. In 2014, 77,000 readers took part in the survey, casting more than 1 million votes. 58 Four Seasons hotels and resorts won a total of 72 Reader’s Choice Awards, accounting for 70 percent of the total portfolio of Four Seasons properties. Four Seasons topped the list of Best Hotels in Central Europe, taking the top spot with Four Seasons Hotel Prague, and also claimed the #1 Best Hotel in Los Angeles & Southern California with Four Seasons Hotel Westlake Village. Condé Nast Traveler’s annual Gold List identifies ­the gold standard of hotels, resorts, and cruise lines as selected by nearly 47,000 of the world’s most discerning travellers through participation in the annual Readers’ Choice survey. 40 Four Seasons hotels and resorts were included in this year’s Condé Nast Traveler Gold List. 18 Four Seasons Spas were placed on the Condé Nast Traveler Best Spas in the World list based on the 2013 Readers’ Choice survey. 39 properties received 61 World’s Best Awards, the most of any hotel brand. Honours include: #1 Top City Hotel in Asia, Four Seasons Hotel Hong Kong; #1 Top Large City Hotel in Europe, Four Seasons Hotel Gresham Palace Budapest; and #1 Top Hotel Spa in Europe, The Spa at Four Seasons Hotel George V, Paris. Four Seasons received four awards, including Best Overall Use of Social Media by a Global Hotel or Resort Chain for the 2nd consecutive year. Four Seasons was named Best Hotel Chain. Four Seasons recognized as the Best Hotel Group. The award names the top 25 places in various categories, chosen by millions of travellers, including Best Family Vacations and Best Food and Wine Destinations, as well as various subcategories of hotels: Trendiest Hotels, Best Bargain Hotels and Best Luxury Hotels, among others. 47 Four Seasons properties were honoured this year, receiving a total of 117 TripAdvisor Travelers’ Choice Awards. Four Seasons was awarded the Best Luxury Hotel Chain. For the 16th consecutive year, Four Seasons was named one of FORTUNE Magazine’s 100 Best Companies to Work For. Of the more than 29,000 properties AAA reviews, Four Seasons hotels and resorts are among the 0.4 percent that made the AAA Five Diamond list. 11 Four Seasons hotels and resorts received the Hotel Award. One Four Seasons hotel received the Restaurant Award. Three Four Seasons Spas received the Spa Award. Condé Nast Traveler’s Readers’ Choice Awards have been a coveted seal of approval for hotels, cruise ships, and airlines from the world’s most discriminating travellers for more than 25 years. In 2013, 80,000 readers took part in the survey, casting 1.3 million votes. 65 Four Seasons hotels and resorts received a Readers’ Choice Award accounting for more than 70% of the total portfolio of Four Seasons properties. Four Seasons dominated the list of Top Resorts in Hawaii, taking the first 4 spots and also claimed the #1 Top Hotel in Central Europe, Four Seasons Hotel Gresham Palace Budapest. 31 Four Seasons hotels and resorts were recognized with Condé Nast Traveler Gold List awards. 32 Four Seasons properties received a total of 55 Travel + Leisure World’s Best Awards. Four Seasons received three awards including Best Overall Use of Social Media by a Global Hotel or Resort Chain. The award names top 25 selections in various categories, chosen by millions of travellers, including Best Family Vacations and Best Food and Wine Destinations, as well as various subcategories of hotels: Trendiest Hotels, Best Bargain Hotels and Best Luxury Hotels, among others. 42 Four Seasons hotels and resorts received 135 TripAdvisor Travelers’ Choice Awards. Four Seasons Resort Hualalai at Historic Ka’upulehu was #1 in both the Top 25 Hotels in the World and the Top 25 Luxury Hotels in the world categories. Four Seasons was named among the leading luxury brands in Robb Report’s Luxury’s 25 Most Innovative Brands. Four Seasons recognized as the Favourite Hotel Group. Four Seasons awarded Best Luxury Hotel Chain. Four Seasons awarded Best for Accommodation in the Readers’ Choice category. Condé Nast Traveler’s 2013 Spa Poll results were derived from the 2012 Readers’ Choice survey, which named18 Four Seasons Spas to the Condé Nast Traveler Best Spas in the World list. The corporate Facebook page was awarded the Best Brand Facebook Page for the 2nd consecutive year. Four Seasons received the Gold Award for Best Overall Digital Magazine and Silver for Best Overall Website. Four Seasons received Gold Awards for Best Overall Social Media and Weddings Campaign. This entry was posted in Business, Hospitality, Hotels, Luxury, Travel Awards, Travel Management, Travel Services and tagged Accolades, awards, four seasons. Bookmark the permalink.